Sunday January 22nd 1899 It was a very pleasant day. Charlie was not here and Will and I took lunch about eleven oclock and went up town. Was at Woolfs first and found Mary quite sick. stopped at home and at Otts a little while. I read in the evening. Monday January 23d 1899 It snowed in the forenoon. Will and I went down to see if [Pink?] would go up home to work for the folks. I sewed in the afternoon and practiced in the evening Tuesday January 24th 1899 It was pleasant again today I hurried through the morning work and had early dinner and we went up town. Mother and I walked over to see Mary Woolf and found her better. We came home early. I read in the evening. 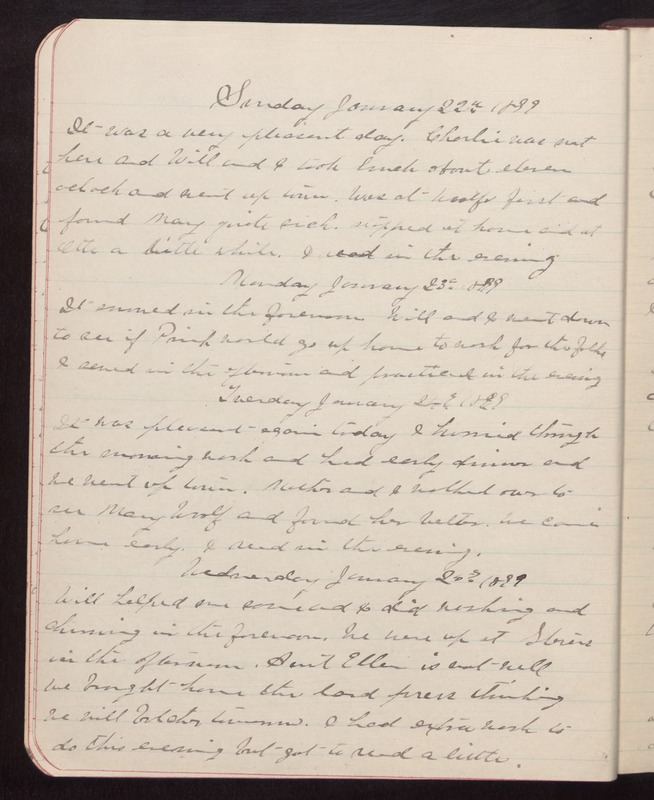 Wednesday January 25th 1899 Will helped me some and I did washing and churning in the forenoon. We were up at Stevens in the afternoon. Aunt Ellen is not well We brought home the lard press thinking we will butcher tomorrow. I had extra wash to do this evening but got to read a little.